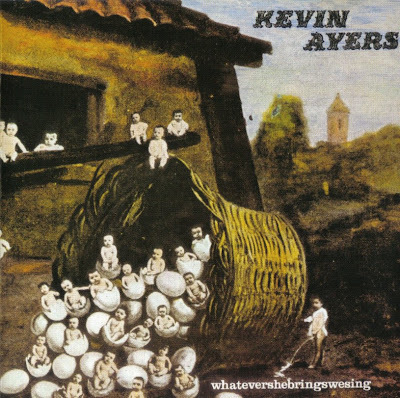 In 1971, Kevin Ayers started recording what would become his most acclaimed album, Whatevershebringswesing accompanied by members of Gong and his previous backing band The Whole World. Praised by NME, Record Mirror and Rolling Stone, the album realised all the musical aspirations Ayers had harboured since the inception of Soft Machine. As with most Ayers albums, a collision of disparate styles confronts the listener but in this instance they work to extremely powerful effect. The title track with Mike Oldfield's guitar accompaniment and Robert Wyatt’s wracked harmonies would become a template for Ayers subsequent 70s output. The album opens with David Bedford’s "There Is Loving Among Us” accompanied by his dramatic string arrangement. This segues into the vignettes "Margaret” and "Oh My” where Ayers juxtaposes terse lyrics against measured backing. "Song From A Bottom of a Well” marries a Stockhausen-esque arrangement to Ayers’ cryptic lyric "This is a song from the bottom of a well / There are things down here / I've got to try and tell”. "Stranger in Blue Suede Shoes”, a flirtation with Ayers love of early rock and roll, would become a staple of his live set for years to come and a song he would re-record twice that decade. Many critics and fans have cited Whatevershebringswesing as their favourite Ayers album and it remains to this day a best seller in his catalogue. A reissue in 2003 added four additional songs; "Stars” (B-side to "Stranger..."), "Don’t Sing No more Sad Songs”, "Fake Mexican Tourist Blues" (1976 B-side to "Stranger...") and "Stranger In Blue Suede Shoes" (Early Mix Previously Unreleased).